This is the kind of book I like to devour with a hot cup of herbal coffee sitting next to a fireplace in a busy coffee house. It delves into the variety of philosophical approaches regarding ethics. Nullens and Michener, in their book, The Matrix of Christian Ethics share tasty bits of knowledge from Aristotle, Aquinas, Kant, Derrida, Nietsche, and many others. They discuss the details of philosophies such as utilitarianism, which looks at what’s best for the greatest number of people. And Kant’s ethics which determine that each individual should be the end of the means, not a means to an end. Even Peter Singer, the philosopher and animal rights activist receives mention. I enter an intellectual “zen-zone” as the authors launch into ideas such as post-modernism, hedonism, desires, happiness, and eventually Christian ethics. However, my zen ends abruptly when I read statements like this: “Through Jesus the disciples learned to understand God as Father. The risen and glorified Christ continued to be honored and worshiped as God. At Pentecost the apostles experienced the work of God’s Spirit mediating Jesus’ risen presence.” (155) Even though I appreciate the concept of applying philosophy and ethics to Christianity, ideas like these can become a twisted knot of confusion. Christian theology like this loses its beautiful simplicity and becomes extremely complex. Sometimes, I think we want to believe something so desperately that we will legitimize the illogical. However, I do think Christian ethics completely make sense with the simple idea of reflecting the Imago Dei. The authors explain, “Humans are moral beings created in the image of God. The redeeming work of the gospel restores and fulfills the purpose of humanity-to reflect God’s goodness. As we strive to live in honesty and integrity and to work toward social justice with others created in his image, this itself images our Creator.” (20) Continuing with this line of thought the authors discuss what it means to be a follower of Jesus. A way in which brings harmony with God, others and the environment. Ideas like this bring me back into zen where philosophies hum in my mind and Christ becomes a way of living, moving and breathing. What do I take from this short blog exercise regarding this book? It is productive to pay attention to the ideas which bring us peace while spending less time trying to untangle philosophies that don’t seem logical. Not that it can’t be fun to debate theology for debate’s sake. However, if one is trying to apply ethics to one’s life it is vital that they be logical at some level. Perhaps the more we complicate Christianity the less it can be applied to our lives. It becomes a mind game of puzzles and riddles that are fun to play with but not necessarily helpful for practical matters. On the other hand, it seems by simplifying the gospel we receive clarity in life lessons and applications. 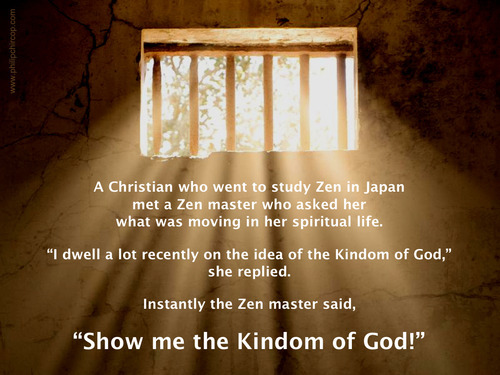 For me, living with Christian ethics means entering into zen – a harmonious existence, a peaceful realm, a focused purpose, and an awareness of those around me. Do you think Christian ethics can be applied to every situation in life? How would you define Christian ethics? How do you apply them to your life? Nullens, Patrick, and Ronald T. Michener. The Matrix of Christian Ethics: Integrating Philosophy and Moral Theology in a Postmodern Context. Downers Grove, IL: InterVarsity Press, 2010.